Let me share with you something about the Disney Parks Blog team – we’re huge dog lovers, which is why we couldn’t wait to introduce you to Lily, a Labrador-Catahoula pup who lives here in Central Florida. When husband-and-wife Disney cast members Francisco and Mejay Aguerre, and their daughter Nicole (also a cast member), lost their beloved Pekingese-poodle mix, Scooby, a few months ago, their house just didn’t feel like a home without a dog to love. Last month, when they began to look online for another pup, they came across a listing for a litter of Labrador-Catahoula mixes. 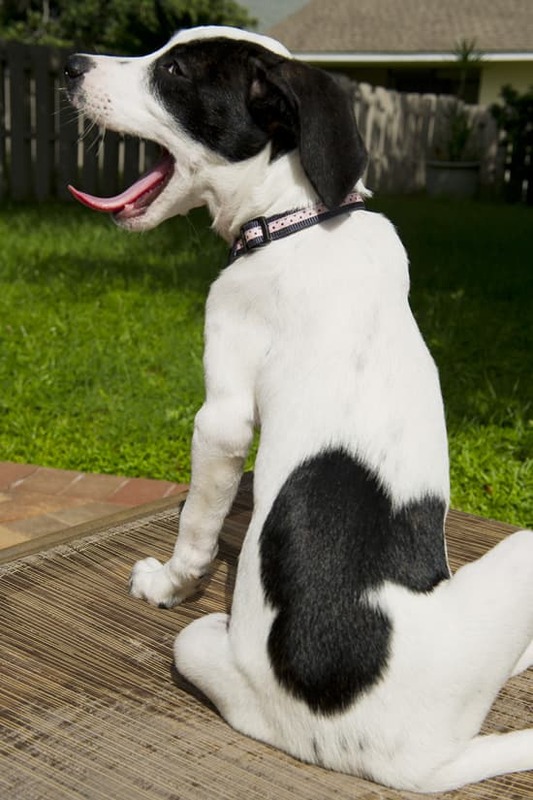 When the listing noted that one of the female pups in the litter was born with “unusual” markings, the family couldn’t believe their eyes when they saw the dog’s perfect Mickey Mouse-shaped spot on her lower back. The Aguerres adopted the pup and chose to name her Lily (after Lillian Disney, Walt Disney’s wife). They recently brought Lily by our photo studio for a rare (and unforgettable) meet-and-greet with the Mouse himself. According to Mejay, little Lily, who is now nearing three months old, is a perfect fit for their Disney family. Hey Jennifer awesome story! What a cool little dog and a great Hidden Mickey! You should check out HiddenMickeyEars.com and their Intsagram ,especially their instagram! They have so many awesome Hidden Mickeys and there’s a few dogs in there too! That is interesting – thanks Matt. How cute! I want a “Mickey” dog! How awesome! 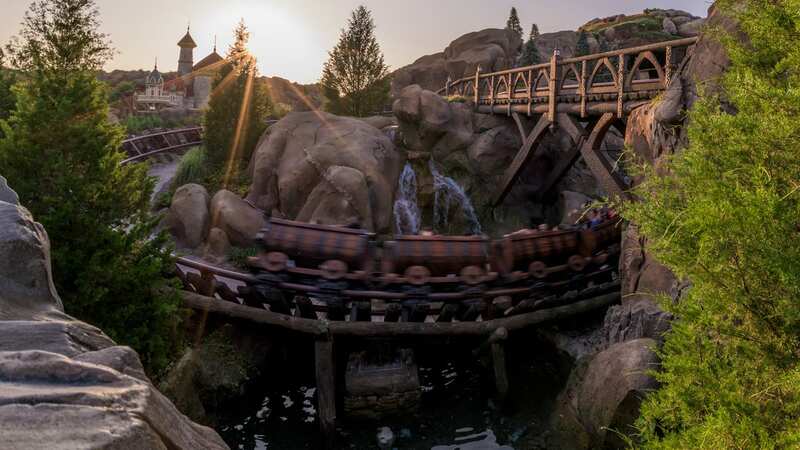 A traveling hidden Mickey 🙂 There it is – now it’s over there…. DOGS AND MICKEY! I love seeing Mickey interact with Lily! This family seems amazing and looks like they got an amazing dog! SO CUTE! Great job Disney Parks Blog! I loooovvvvveee the video! I was there when they filmed this and Lily is a real sweetie! She reminds me of Minnie Moo! I spot a hidden mickey.. I have a cat with the same markings. His name is Mickey Meowse!! Hi Jennifer! Lily is so cute. But I have to say, you will be amazed at my dog Minnie’s hidden Mickey!! She is an absolute hit with the kids at the dog parks. You will see why her name is Minnie! How can I send you a pic?? Jennifer – I have a great photo of a hidden Mickey. How can I send it to you? Awesome! Is there a place to share animal spots? I have a Dalmatian, FireBelle, with a smaller Hidden Mickey on her in just about the same “spot”! Thanks for sharing the pic, Jeff. That’s a great spot! Move over Pluto! This pup just took his Mickey devotion to a whole new level!! That’s quite a hidden Mickey! That is hands down the cutest pet I have ever seen. The Aguerres family is very lucky to have Lily! I had the pleasure of meeting the family and Lily. I have to say that they are a very loving family for her. She’s adorable in person!